Ash Keating was the inaugural winner of the Guirguis New Art Prize (GNAP) in 2013 for his multi-screen video, West Park Proposition, 2012. The judge, Jason Smith, Director, Heide Museum of Modern Art (MoMA) said, "Ash Keating's work West Park Proposition, 2012 kept drawing me back in the several hours I spent viewing the works. It simultaneously affirms the political and critical role of the artist as a key agent of change and action, and someone who reminds us of the beauty and resilience of humanity and nature in the face of unrelenting change. As a work combining performance, collaboration and hope, Keating's West Park Proposition is a work of immense and compelling poetry." Ash Keating works across a conceptual, site-responsive and often collaborative art practice that incorporates painting, sculpture, installation, video, performance and public interventions, and has referenced a wide range of social and environmental issues within his art. Frequently working beyond the gallery, and often harnessing community narrative and energy, Keating's work also draws upon myth, ritual and ceremony. Keating's West Park Proposition, 2012, is a three-channel and screen video installation, utilising multiple camera video documentation of an endurance painting intervention undertaken on the morning of September 1, 2012, on the east facing wall of a newly built tilt-slab industrial building, situated on the direct edge of the current urban and rural boundary in Truganina, Victoria. 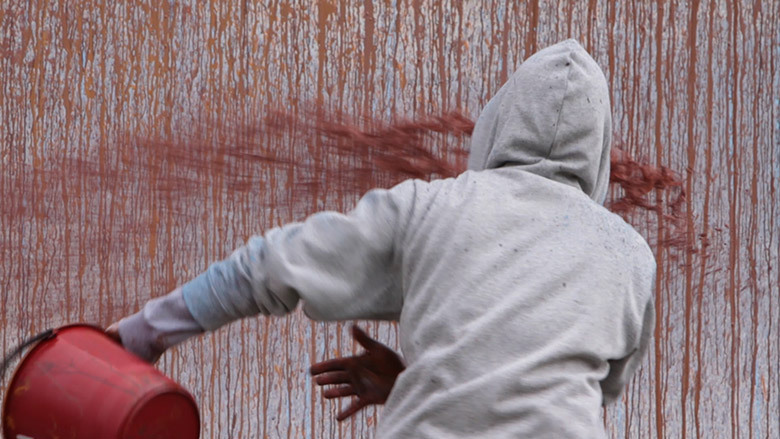 The multi-screen work documents an endurance guerilla-style action painting intervention and ritualised painting performance in which a symbolic violence is enacted against a storehouse of commodity production and consumption. This project was originally commissioned by MUMA I Monash University Museum of Art and made possible by funding from Arts Victoria.